What is Hand Foot and Mouth Disease? | Breezy Mama Breezy Mama - Expert parenting advice, celebrity interviews, product reviews for kids, moms and babies and more! The "hand" of hand, foot and mouth disease. Hand, Foot and Mouth disease–it reads like something that only animals should get. But it’s not–everyone in your family–including you, the kiddos, Dad, and the grandparents, could contract the disease. So what exactly is it? One Breezy Mama reader wanted to know–when her child was diagnosed with it she had no idea what it was, and those around her had never heard of it either. She asked Breezy Mama to get on the case and bring an explanation. So we turned to our Go-To pediatrician, Dr. Jon Conti for enlightenment. What exactly is Hand, Foot and Mouth disease? 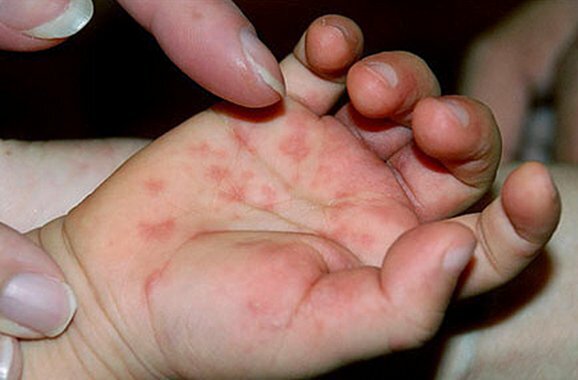 Hand, Foot and Mouth disease (HFM) is a common viral infection characterized by the eruption of small flat red bumps, primarily restricted to the hand and feet, and associated with oral ulcerations and fever. Classically we think of three viruses that live on the surfaces of objects: Coxsackie, Enterovirus and Herpangina. Herpangina is not the same virus as Herpes, but many people confuse the two and become unnecessarily worried. Unlike Herpes, Herpangina goes away. 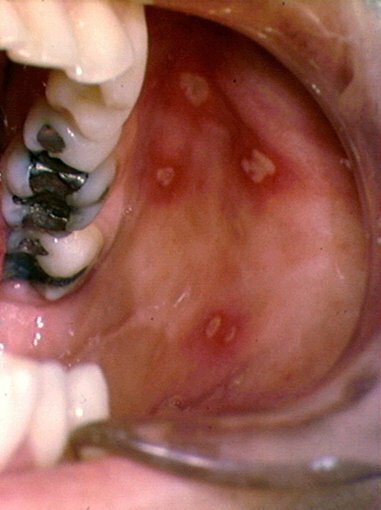 Usually children come into contact with these viruses when they place something dirty in their mouths. There can be small epidemics in the summer and fall (especially in day cares and preschools), but we see it year around. Less common, but also seen, children just may get the rash on the hand or in the mouth, without the fever. Some older children will get no symptoms at all. Or any other variation. Diseases sometimes don’t read textbooks. The "foot" of hand, foot and mouth disease. The "mouth" (or cheek) of hand, foot and mouth disease. A parent always gets freaked out when they hear Hand, Foot and Mouth disease is going around, but isn’t it basically like catching a cold? It’s kind of like a cold, because the HFM viruses are everywhere and very contagious. And like a cold, when your child gets it, it can be a pretty miserable few days of illness. I think that people get freaked out by it because there is an unrelated, but similar sounding entity called ‘Foot and Mouth Disease’ or FMD (also called ‘Hoof and Mouth Disease’). FMD is a severe, highly contagious viral disease of cattle, pigs, sheep, goats, deer, and other cloven-hoofed ruminants. FMD is not a threat to people, and no human health risks are associated with the disease. People have heard about FMD in the news because it is a threat to the agriculture industry, and numerous world-wide outbreaks have occurred; in order to stem the spread, tragically millions of animals have had to be culled as a result. For more information see: http://www.aphis.usda.gov/newsroom/hot_issues/fmd/fmd.shtml. Is Hand, Foot and Mouth disease contagious? How does one get it? Yes it is contagious, usually by direct contact with mucus, saliva and feces. The viruses live on surfaces of floors, toys, playground equipment, door handles, etc. Commonly one gets it by putting an unwashed hand, fingers or toy into the mouth, and then in about 4-6 days: voila! Can it be passed from child to parent and vise versa? Sure, it’s possible. The good news is that as you get older, it is less common since 1) your body can fight off more and more of the viruses, 2) you have better hand washing, and 3) you don’t put your hands in your mouth as often. If your child has sores on the mouth does this automatically mean that they have Hand, Foot and Mouth disease or are sores found with other things? No, nothing in medicine is automatic, and there are many illness that also have sores in the mouth. For example, early on the rash of HFM can look like Chicken pox, or the throats can seem like Strep throat. This is where your pediatrician or family practitioner comes in to help you make the distinction. If your child does have it, how long will it stick around for? Generally about 5-7 days, but some up to 10 days. What can you give a child to feel better? People always think about Tylenol or Motrin for comfort, but sometimes something cold & soft, foods like crushed ice, popsicles or ice cream, works really well. Please remember, NEVER give an infant or child aspirin. Also keeping the child well hydrated helps to prevent the common complication of dehydration. Consider avoiding acidic juices like orange or lemonade. I try to stay away from over-the-counter mouth numbing medicines because in some children they can have severe side effects. I’ve heard that if you or child catches Hand, Foot and Mouth disease, that there’s nothing your doctor can do to help it—is this true? If you are wondering if there is an antibiotic used to treat it (like with Strep throat), then the answer is ‘no.’ Antibiotics kill bacteria, and not viruses like HFM or the common cold. Furthermore, a vaccination has not yet been developed for it. • wash toys with soap and water, then disinfect them with a solution of chlorine bleach (made by mixing 1 tablespoon of bleach and 4 cups of water). • avoid close contact (ie. kissing, hugging, or sharing eating utensils or cups) with others. Number one on the list is keep your little ones’ hands clean, especially before eating. I see families allowing their kids to snack while playing at the park, and there is just a lot of opportunity to touch something full of germs right before popping in that cookie. If you see the symptoms for Hand, Foot and Mouth disease, should you go to the pediatrician or, again, is it similar to a cold and you wait it out? • You want your doctor to confirm the illness so you know what to expect. • Your child looks or acts very sick, or isn’t responding to Tylenol/Motrin. • If they complain of a stiff neck, severe headache or are acting confused/lethargic. Sometimes the name of an illness, like HFM, pushes all the right parent anxiety buttons. My hope is after this post, you will have more information and can boost your confidence when caring for your family. Thanks Ladies! I had sent a request some time ago (a year?) so I thought it had just been overlooked. Thanks for the valuable info and I have but one thing to add. Once your child has gotten this it is very easy to get it again. One would think the immunity would build but with this one not so much. We just dealt with this in our house last month. Fortunately it was a really mild case, in terms of discomfort, but unsightly! J and I had this two years ago and it’s HORRIBLE! Please keep in mind that this is NOT just a kid disease, and it’s highly contagious. I wash my hands all the time, and somehow still got it! It’s very painful and though most kids bounce back from viruses quickly (my son got a mild case and was only grumpy for a couple days) I was miserable for days and it seemed like it took forever for all the little bumps to finally go away.